Perched atop the owner's home, the 2.5 Bedroom Suite is a home away from home. Constructed with only the finest materials and decorated with a true eye for detail. In this second story suite could sleep five to a maximum of seven people in three separate bedrooms. 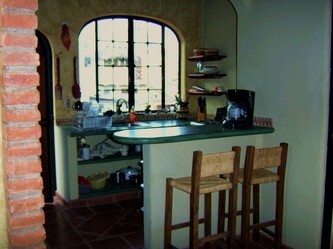 - Full kitchen includes an oven, larger fridge, coffee maker and blender, even a balcony for people watching. 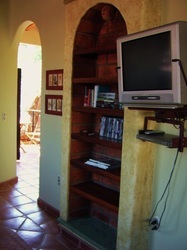 - Separate dining and living room areas with DVD player for watching the owner's vast collection of movies. - Desk area for writing or computer use. - Filtered water for drinking on site. - Wireless internet, Cable TV and even a few good reads, this unit has it all! 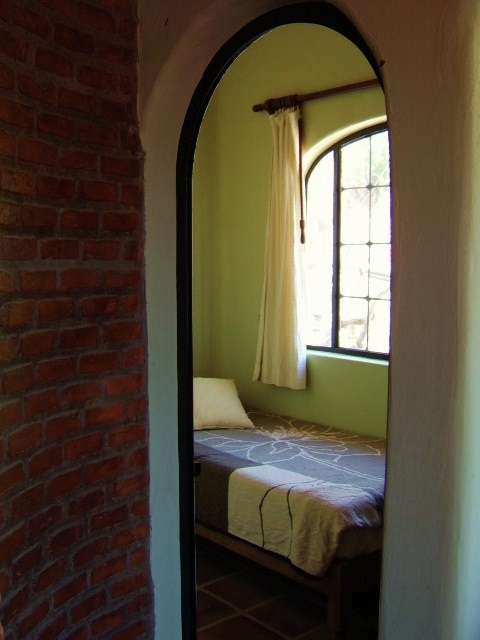 The price range is between USD 150 - 210/night depending on season (for up to 5 people, additional guests cost extra). See more under "Costs and Reservations". Or simply fill out the contact form further down on this page. Pictures of the rooms can also be found below. El apartamento de dos recámaras y media es el mas ámplio de todas las unidades, muy bien construido y decorado, los techos altos dan una agradable sensación de amplitud, lo que lo hace un lugar especial para un grupo de amigos o parejas, o para una familia. Tiene una recámara con cama matrimonial, otra recámara con dos camas matrimoniales (una elevada) y otra recámara con una cama individual, mas una cocina completa con refrigerador grande, balcón a la calle, sala, comedor, escritorio, pequeña terraza cubierta con vistas, baño completo con tina de piedra cantera, TV, DVD, acceso a películas en DVD, libros, acceso a agua filtrada para beber. ​Se encuentra en el segundo nivel, sobre la casa de Marcelo, el dueño del lugar. 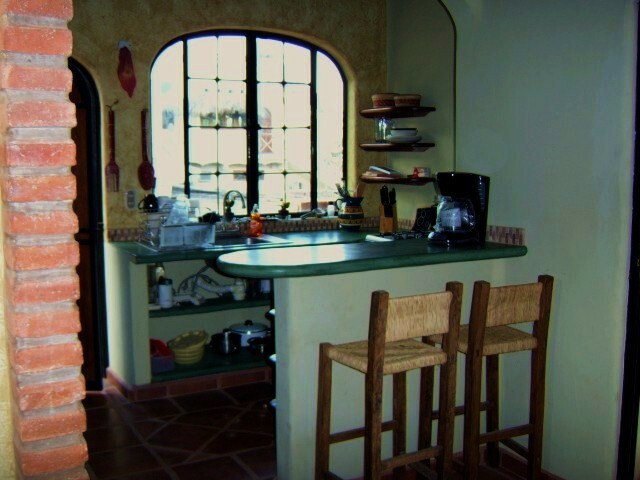 "Five teacher friends and I just returned from two wonderful nights at Casitas Tortugas. We stayed in the 2.5 Bedroom Suite, one of the nicest places I have ever stayed in all my world travels. Marcelo (who is an incredibly friendly and helpful host) has handcrafted the apartment into a true piece of architectural and design art. 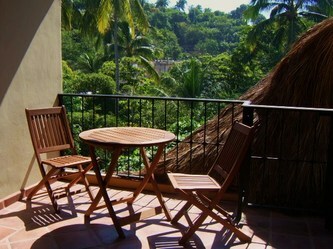 The location is great as well - just a short walk from both the beach and the main plaza. I highly recommend a stay at Casitas Tortugas! Happy travels!" "My friends and I have been treated like royalty here in the upstairs 2.5 Bedroom Suite by Marcelo and Brynne. It is built as a two bedroom, but actually it's a three bedroom (sleeping 7 people!!) but the little bedroom has a single bed. We have had a fine time at the beach during the day and either cooking our own food or going out to eat (there's at least 20 restaurants within 2 blocks from the house!!). In the evenings we enjoy sampling Marcelo's outstanding collection of movies. All of us enjoy the front veranda, watching the passers-by on the street... and especially the back veranda with its magnificent view up into the jungle-covered hills, with little houses and great big mansions!! The back veranda has a table and chairs and sunlight streaming in all day long and stars so bright you can almost read by them at night!!" Read more comments from our guests at TripAdvisor reviews.